As a clinical psychology instructor at the U.S. Army’s Medical Field Service School, in San Antonio, my job was largely involved with teaching a wide variety of forms of psychological testing. 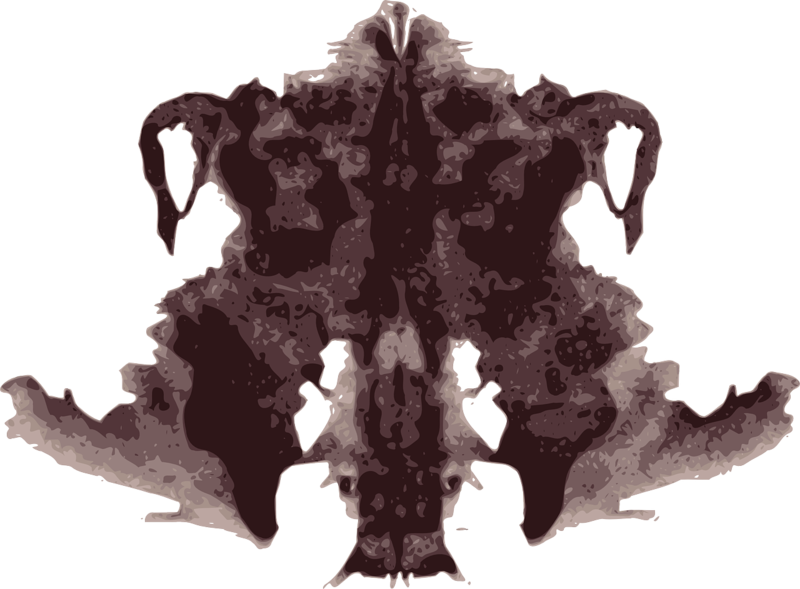 The famous Rorschach inkblot test was among them. It is a specific example of a category of test called projective tests. The other main type is called objective tests. The difference is that in objective tests, there are right and wrong answers. The capital of New York state is never Los Angeles. They are pretty cut and dried. Projective tests, on the other hand, are intentionally designed to be as ambiguous as possible, because their purpose is not to find out what someone knows, but to find out how they think. When provided with sources of ambiguous stimulation, an observer has little choice but to remain silent, or expose themselves. But most people don’t realize how much they are exposing let alone what it is. They usually aren’t aware of revealing much of anything. That’s why tests like the Rorschach have become popular to clinicians. The key concept here is that when asked to fill in details, interpretations, and meanings in an ambiguous situation, we instinctively start making things up. It’s the only way to respond. And as we choose from what is before us that which we will focus on and embellish, we reveal our preference. And by reading the flow of preferences and the choices they dictate, we can see into the very matrix of beliefs around which that person’s entire reality is being formed. Now here’s my point. Reality is the mother of all Rorschach inkblots. It is totally ambiguous, but it’s in full, three-dimensional living color, not two-dimensional black-and-white. It can also be used just like the Rorschach, to see into the psyche. We make interpretations of (what we think of as) reality constantly. Because of the ambiguity of reality, we have to make a lot of it up. Actually, all of it would be closer to the truth. And we do this in whatever way we do because our beliefs tell us that this is the best, most beneficial way to do it. In “problem areas,” we are at crossed purposes with ourselves. We have conflicting beliefs which predict opposing outcomes, and we don’t know which one to believe. It is the classic double-bind: you’re damned if you do, and you’re damned if you don’t. But when you view life as a gloriously improved inkblot, you can see so much about yourself. Now at first you may be talking about looking at a few specific situations, but I’m not. I’m talking about trying to catch yourself, I mean really catch yourself, making it all up. To see clearly, even if for just one fleeting moment, that you are taking a perfectly neutral canvas and creating a picture with your eyes, heart and mind, of that experience you know as reality. It’s all you experiencing yourself in external form(s). Which leads me to my view of what/who God is. It may not be perfect, but it’s by far the best I’ve been able to come up with. We are gods within a God, who, according to my best sources, is not sure if he/she/it is also a god within a God. She/he/it is highly suspicious that it’s true, and really wants to find out. Meanwhile, this God, and all the gods within it, are playing the same game, and it’s the only game it town. It’s called Find Out Everything There Is To Know About Yourself, or something like that. But it’s taken very seriously by every bit of consciousness in the system in which we have our existence. Now, GOD creates Gods, who in turn create gods, and so on. And they all have the same agenda: knowing themselves completely. But there is a slight problem: every time you learn something new, you get bigger and there’s more to learn. Seth calls this the Primary Cosmic Dilemma. Now here we are, these gods within Gods within GODS, all just trying vainly to know ourselves completely. And it’s the tragedy and the glory in living. It’s what’s made this little biosphere such a cosmic tourist trap. If you’d like to explore this perspective more fully, try this link. mirroring, reality, reality creation, RealityAsRorschach, rorschach. Bookmark.